Administrators and Committee Managers can add or request evaluations from scholars who are external to the committee (or even the institution) to help them evaluate a candidate. There are two ways to add external evaluations. Administrators and Committee Managers can upload an evaluation they have on their computer to the candidate's case, or can request evaluations from one or more external evaluators by email. 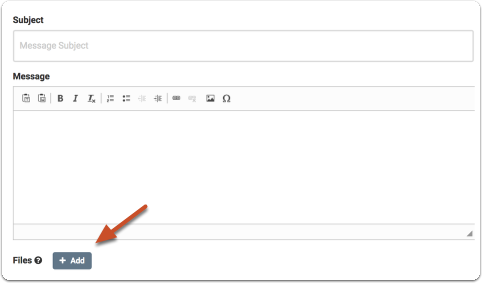 If requesting an evaluation from an outside scholar by email, the evaluator will receive an email with instructions for submitting the document and can upload it directly to Interfolio without having an Interfolio account. Only Administrators and Committee Managers can add or request external evaluations. The buttons and procedures explained below will not appear on the case page when viewed by a committee member who is not also an Administrator or Committee Manager for the case. External evaluations uploaded this way will appear in the External Evaluations section along with the name of the uploader and the date of the document was added. Files added to the External Evaluations section are uploaded as confidential documents that cannot be shared with the candidate. 1. 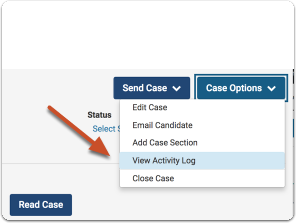 On the case page of the candidate, scroll down to the External Evaluations section and click "Request Evaluation"
This will open a window where you can configure and send an email request for an external evaluation. Note that you can click "Add Another Evaluator" to use this form to request letters from multiple evaluators. This is a hard deadline, meaning the recipient will not be able to submit an evaluation after the deadline date. 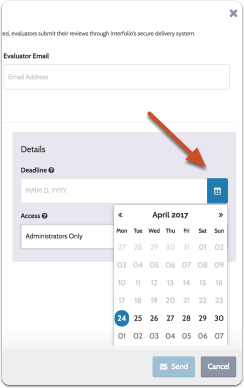 Look to the right of the page, and click the dropdown menu to select who can view the request while it is pending, and can access the evaluation when it comes in. 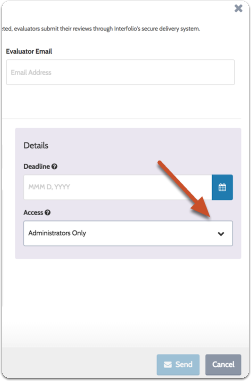 By default, access is limited to Administrators only, but can be set to Administrators & Committee Managers, or to Administrators & Entire Committee. 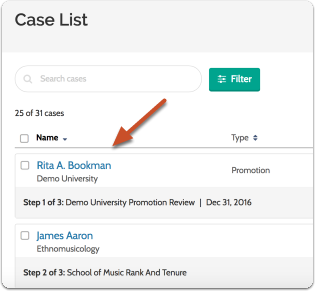 You can attach files from the case that may be useful for the evaluator. The files you add here can be downloaded by the recipient when they accept the invitation to write an evaluation. If your institution has branded Interfolio with custom colors and added a logo, these will appear in the email sent to the evaluator. The request (and the evaluation once it comes in) will appear in the "External Evaluations" section. When an RPT administrator or committee manager uploads an external evaluation we record that in the activity log, accessed at the top right of the case page. First_Name Last_Name (email_address) uploaded a confidential evaluation titled "file_name"